At least two Palestinian journalists were injured while covering mass protests on the Gaza border on April 13, 2018, according to the Palestinian Journalist Syndicate (PJS), the journalists' employers, and news reports. Ahmed Abu Hussein, a photographer for the Voice of the People Radio--a radio station affiliated with the Popular Front for the Liberation of Palestine--was hit by a live round in his abdomen while he was covering the protests east of the northern Gazan city of Jabalya, according to his employer, the PJS, and news reports. Abu Hussein was immediately transferred in critical condition to the Indonesian Hospital in Jabalya for treatment, according to Palestinian journalist Moneeb Saada, news reports, and social media posts. A video posted on Facebook by Saada shows that Abu Hussein, who was wearing a vest marked "PRESS" and a helmet, was standing among civilians and taking pictures of the burning of tires from behind the protest when a shot is heard and he fell to the ground. 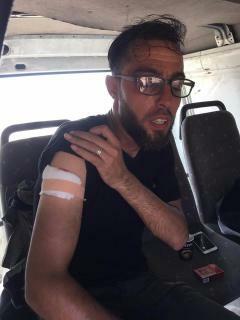 Mohammed al-Hajjar, a Palestinian photographer for the news website Middle East Eye, was lightly injured by a live round that grazed his right arm while he was covering protests east of Gaza city, according to his employer, the PJS, and news reports. A picture posted on Middle East Eye shows Al-Hajjar with a bandage over the wound on his right arm. For the third consecutive week, thousands of Palestinians joined the protests in Gaza Strip against Israel's refusal to allow Palestinian refugees to return to their pre-1948 homes, news reports said. Since the protests began on March 30, at least 12 Palestinian journalists have been wounded by gunfire and one, photographer Yaser Murtaja, was killed, CPJ research shows.